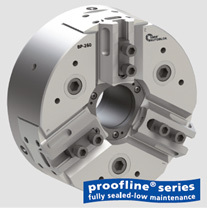 The Completely Sealed chucks are now available in Standard Open Center chuck, bringing high-production technology to Workholding systems in standard machines. The new SRG grinding steady rest series is used to support shaft type work pieces on grinding machines. The integrated with a micrometer fine adjustment of the horizontal and vertical axis & Follow down features. Retractable steady rest arms allow for auto load of the work pieces. The SRG grinding steady rest is available for grinding dia. 3-136mm in 9 sizes now! The new standard chuck AcuGrind is designed for high precision turning and grinding operations. 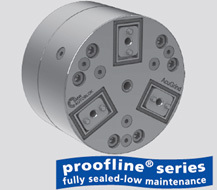 The AcuGrind chuck is a Proofline series chuck – fully sealed and low maintenance. AcuGrind can be ideally installed on grinding machines. The new AcuGrind is available in the sizes 80 – 250 mm now. The new Pull down chuck is designed for clamping of workpieces with highest demand of parallelism & concentricity between ID & OD. The chuck is a Proofline Series Chuck – fully sealed & low maintenance. The chuck is equipped with Quick Jaw Change Feature which increases the productivity where frequent setup change is required. Jaws are interchangeable between chucks of the same type without loss of accuracy. The chuck is available in the sizes from 170 to 530mm now. The recently developed KNCS-2G - the new generation of quick jaw change chucks - comes with a Sealing Features. 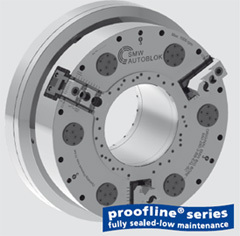 Seals on both faces of the base jaws and sealing components inside the chuck body prevent the chuck from dust and swarf penetration. This reduces down times and the costs for maintenance. Due to the quick jaw change system, the set up times will be minimized. The wedge bar drive and case hardened parts guarantee highest accuracy and precision. 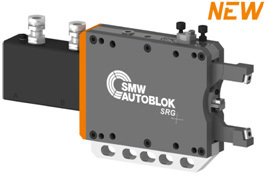 The new series KNCS-2G is available from now in the sizes 210 to 400 in addition to the standard line KNCS-N.
NEW: The SJL 6-jaw chuck ensures highest accuracy for clamping of easy deformed workpieces. The SJL performs highest radial and axial clamping accuracy. 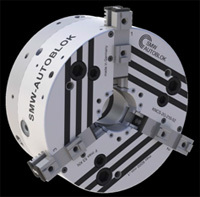 Combination chuck: Adjustable to 2+2+2 Equalising or 6 jaw Self Centering clamping. The SJL is fully sealed and oil bath lubricated. Due to the centrifugal force compensation the chuck is ideal for high speeds. The new SJL is now available in the sizes 225, 290 and 400 mm on stock! Matching top jaws are also available. 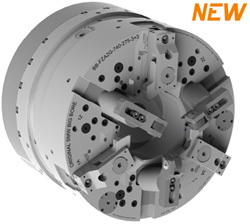 The new Big Bore chucks with, Sequence clamping enabling feature, for Self Centering & compensating clamping. Adjustability of axial centering position for Pipe Threading using centering jaws. Extra Large through hole with Extra Long rapid & clamping stroke. Equipped with Pressure control & individual stroke control of each jaws in compensating mode. Reduces the clamp de-clamp time & ensures high productivity. 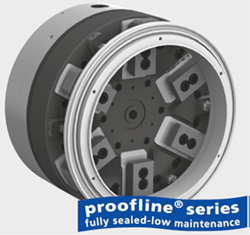 The chuck is a completely Sealed Chuck ensuring Low maintenance, long life & high availability of machine. Step mode for partial opening / clamping for shimming.